Meyer Lemon Roast Chicken is a delicious way to perk up your weekly meal plan ~ the flavors are bright and sunny, and the whole dish looks as beautiful as it tastes! This vibrant and citrusy roast chicken will make a regular old weekday meal feel special. It doesn’t take any more time than plain oven roasted chicken, but a quick sauce of Limoncello lemon liqueur, olive oil, lemon juice and stone ground Dijon mustard makes the whole thing sing. Meyer lemons are sweeter than regular lemons, and have delicate thin skins, so you can eat the roasted fruit right along with the chicken. No one is exactly sure about the botanical origin of Meyer lemons, but they are probably a cross between a regular lemon and some type of orange. Cut the slices between 1/8 and 1/4 inch, and remove the seeds before adding them to the chicken…they become wonderfully tender in the oven. I make it a point to get a bit of lemon with every bite of chicken. It’s fabulous. This chicken roasts at 475F, hence the gorgeous color and crispy skin. I love cooking at high heats, it must be a primal instinct. I love the sputtering, sizzling sounds and smells, and it’s fun to watch all the action safely through the oven window. Taking food just to the brink of burning develops an alluring flavor, especially in meat. Be sure to cover your pan well, because the sauce will burn. I would actually recommend taking the foil and wrapping it up around the lip of the baking sheet to be extra sure. I used parchment paper and had a messy pan to clean up. Sprinkle the chicken pieces liberally with salt and plenty of pepper. 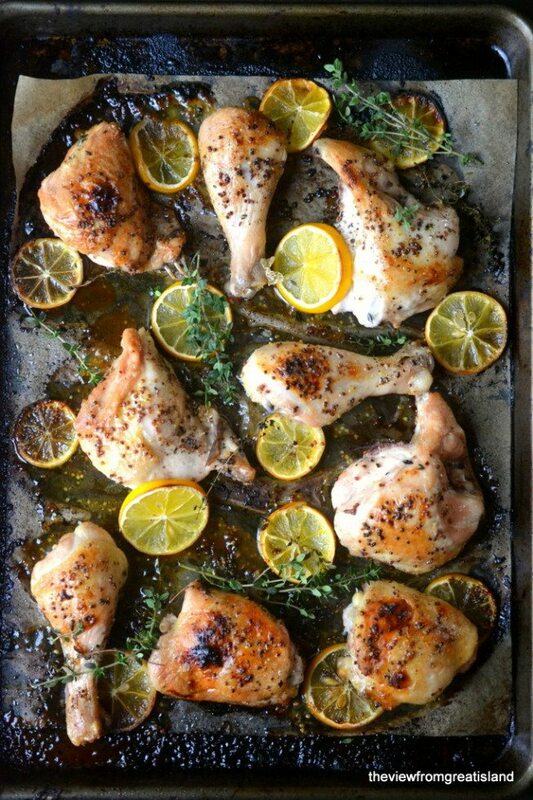 Line a baking sheet completely with foil or parchment paper and lay the chicken out, along with the sliced lemon and some of the fresh thyme. Make sure your pan is big enough so you don't crowd the chicken. Pour most of the sauce evenly over the chicken pieces, reserving a little for basting later. Bake the chicken for about 35-45 minutes until golden and crisp on the outside. Baste the chicken with a little of the reserved sauce about 5 or 10 minutes before it is done. Serve hot with the lemon slices on the side. 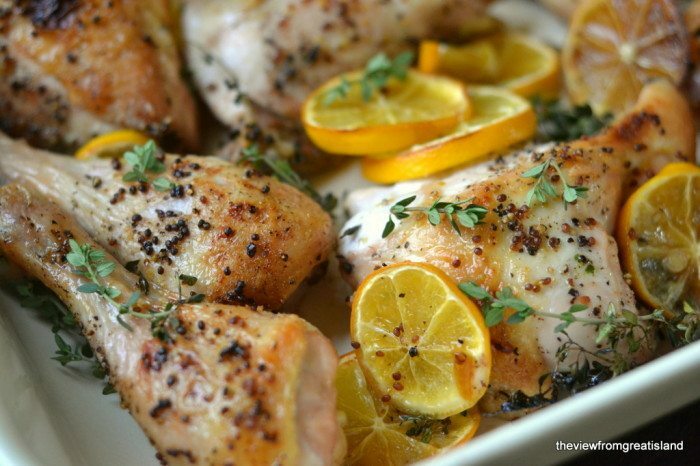 Don’t forget to pin this easy Meyer Lemon Roast Chicken! This was sooo delicious!! I LOVED the sauce!! It was also quick and easy to prepare and clean up. My new favorite chicken recipe!!! This recipe was delicious. I wrote a more detailed comment that disappeared before I could post it, so I’ll make this one shorter. I used bone-in skin-on chicken thighs and regular lemons with great results;baked the the thighs for about 50 minutes and they were moist inside, crisp outside, deliciously seasoned. The lemon slices were tender and delicious as well, although not everyone ate them. I will make this recipe many more times; it was easy and so delicious. Everyone at my table loved it! I would just use a large pan, Ligia, so the chicken has enough room to crisp up in the oven. Is there anything I can substitute for the limoncello? We don’t typically use it and don’t want to buy a whole bottle for one recipe. You can substitute white wine, or chicken stock, or even water! 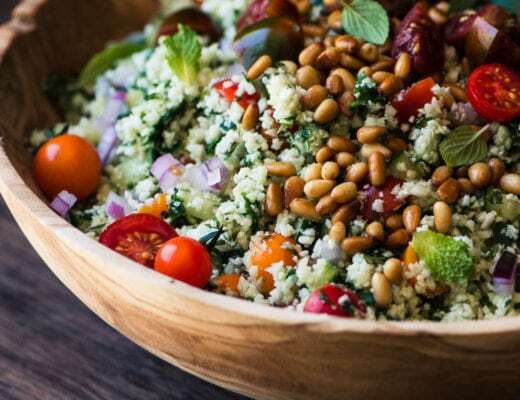 I made this the other night and it was easy and delicious…Making it again for another dinner party..Curious…what sides do you serve with this recipe? Thinking of making this for dinner. But, I only use boneless and skinless chicken. Any changes I should make to the recipe? I think you could do it the same way, April, but just reduce the cooking time. — just in case you want to track her down if you didn’t give permission. And I will be trying this recipe soon! Looks and sounds great. Thanks so much for taking the time to let me know, Ani, I appreciate it. It’s very discouraging, and this is one of my favorite recipes! new home is proceeding apace. I have preserved Moroccan lemons which we adore and in different ways. Would the recipe be the same as to amount of lemons (mine were quartered and salted before tamping them down) and the rest of the instructions? I think you’d be fine to substitute the preserved lemons, Sharon, although I imagine they have a stronger flavor than the Meyers do, so use your own individual taste as a guide. Sounds delicious! I made this recipe again d it was just as fast, easy and delicious the SECOND time. My foodie friend made it for her husband and served it restaurant style plated on a bed of rice (a combo of wild and other types of rice) surrounded by baby peas and fresh sprigs of thyme. The presentation sounds beautiful. My friend and her husband agreed this was a dish they would pay $$ at a fine restaurant! I would try this next served with brown basmati rice..the nutty flavor of the rice with the lemon sauce would be a delicious combination. Oh how I love Lemoncello. When I noticed the ingredient, I knew exactly what I would be making for dinner. It was bright yet rich and as you suggest, best with a bit of Meyer lemon in each bite. It was also beautiful (would love to send you a picture) and my house smelled like citrus heaven. Thank you for the inspiration, now I’ll be experimenting with Leomcello outside of the martini. Please send a picture, Kami! Fast, easy, simple and delicious (tastes like a dish I would pay $$ when dining out). I used skinless, boneless, chicken thighs (as nice that is what I had today), regular lemons (have never seen a Meyer lemon in my grocery store) and fresh Rosemary sprigs (from my Rosemary plant) and cut the cooking time by five minutes. Thighs were moist and flavorful. Served them accompanied by the sauce drizzled over wild rice. Saw several other recipes on you site that I also want to try!!! 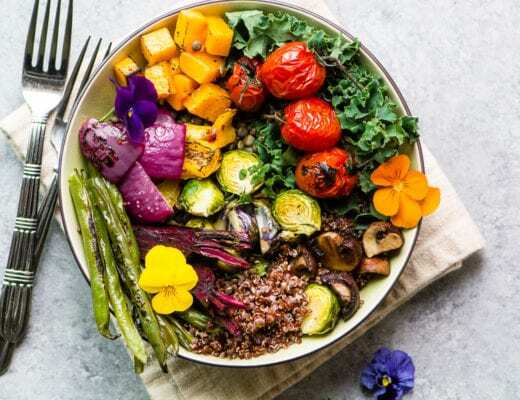 Sounds great — the wild rice is a nice touch, I’ll have to remember that! Absolutely fabulous way to roast chicken. The Meyer lemons and Limoncello really make this dish special. The aroma of the chicken while it’s roasting is intoxicating, and the meat is unbelievably tender and moist. Pour the drippings over the chicken when serving and OMG! Everything is so beautifully flavored, you’ll want to eat more than you should and then lick the plate clean. Thanks, Sue. . .you did it again. 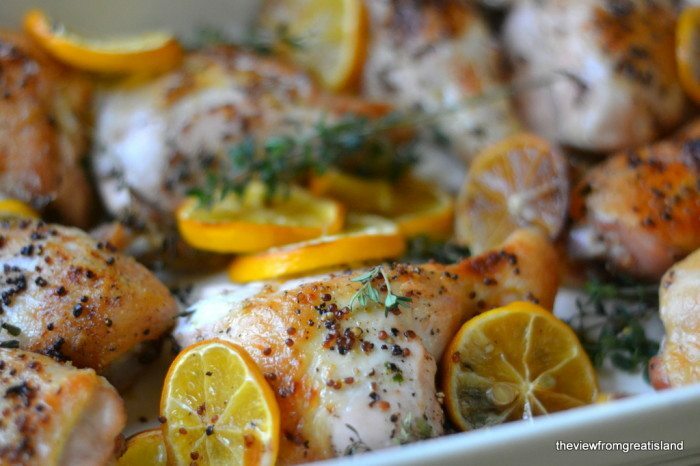 Citrus flavored poultry is perfection. This looks and sounds delicious. 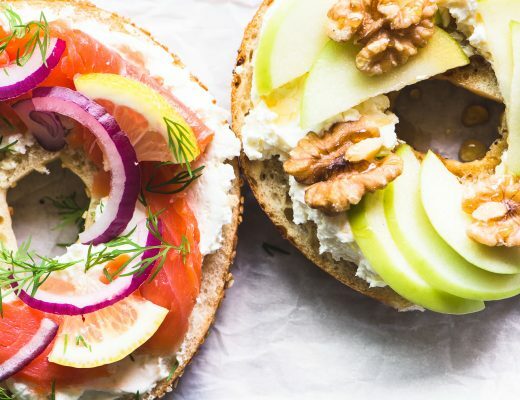 The crisp skin, the seasonings, the juiciness – I love it all! Do you cook this with the skin on or remove it first? Made this last night for dinner. It was awesome. Hubby loved it as well. Will be my go to roasted chicken recipe from now on. Happy to hear it, Jane! Now I know what I’m going to make when the kids come for Family Dinner night on Tuesday! Thanks. Can you get meyer lemons from the greengrocer or only home gardens? And I happened to have some Meyer Lemons! Thank you! Thanks, Adam! This is one of those recipes where the visuals really reflect the wonderful flavors. Thanks for stopping by. This looks wonderful and I’m so glad it has limoncello. I’ve just found another way to use the bottle in my frig. Gorgeous photos as always. What a gorgeous chicken. Simplicity is perfection! 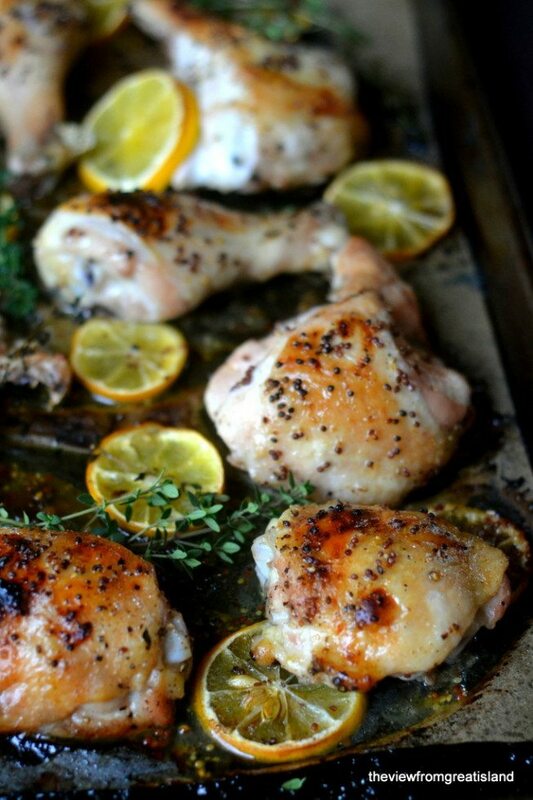 I love roast chicken with Meyer lemon, a perfect dinner! OMG Sue!! I made the same thing to post next week only I used basic lemons…. But your’s looks and sounds so delicious with the Limoncello in there, great idea!! the picture of all of the roasted pieces of chicken? amazing!